An exciting community art project which celebrates a New Brighton legend has been given the green light. The project is moving forward thanks to a successful bid for £10,935 by the New Brighton Coastal Community Team (NBCCT) to the Burbo Bank Extension Community Fund; a grant scheme set up by DONG Energy to beneﬁt voluntary groups and organisations located near to the coastline where it is carrying out the extension to the offshore wind farm. Work on the mermaids is likely to start in the autumn, with the aim of being installed ready for visitors in or around May 2017. 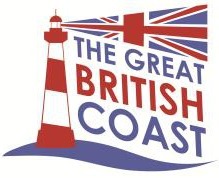 Cllr TonyJones, Wirral Council’s Pledge Champion for ‘building a vibrant tourism economy’ and Chair of the NBCCT, said: “New Brighton is steeped in maritime history and the revitalised New Brighton is committed to building on this, bringing it back to life even as we look to the future. in different parts of New Brighton. The plan is for six mermaid statues to be installed in locations across the resort creating a trail around the area. Competitions and community events with the trail as a theme are planned and updates on the development of the installation will be promoted on www.wirral.gov.uk/newbrighton, www.visitnewbrighton.com and www.visitwirral.com, as well as being communicated through social media. The work ofNew Brighton Coastal Community Team can be found at www.wirral.gov.uk/newbrighton. 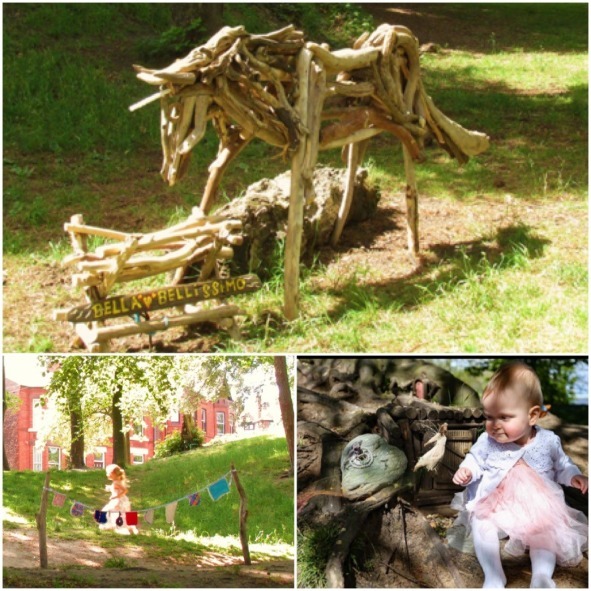 Updates about the project can be found on Twitter @wallaseyteam, using the hashtag #MermaidTrail. fundraising events. made donations or sponsored new stones. 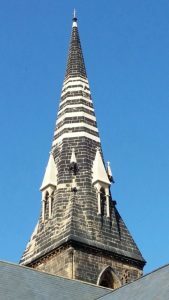 We would like to think that the restoration of St James’, together with all the work going on at the Dome of Home, is symbolic of the wider regeneration ofour marvellous town. If you have been inside St James’ church, you will have seen the magniﬁcent wall paintings. These were created by a famous Victorian church artist, Alfred Hemming, and are of a scale and quality which is unsurpassed in any provincial parish church. Do pop in and take a look if you have not seen them before. Unfortunately they have been deteriorating due to damp coming through the walls and roof. So we must now focus on eradicating the damp and then conserving these magniﬁcent works of art. So, the fundraising and grant applications will have to continue. There is lots of hard work ahead. But just for a moment. 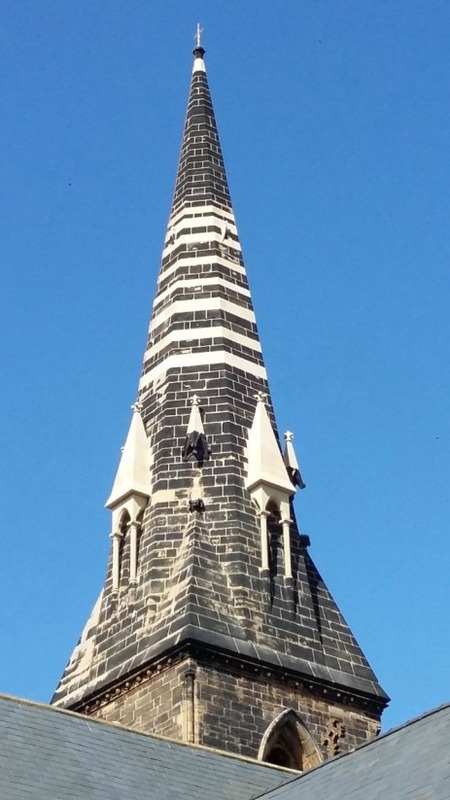 let‘s sit back and enjoy the visual splendour of New Brighton’s stripey new spire! As you will have seen from the media our historic lifeboat station was temporarily closed by the RNLI on the 21st July following the dismissal of 12 experienced lifeboat crew. This followed a dispute with management since last October during which time 8 experienced crew resigned. On the 8th August the station re-opened with only our Atlantic 85 lifeboat operational on a much reduced cadre until the end of summer when a review of the service would be carried out. So far we have had 27 call outs this year and I thought it appropriate to reﬂect on some of the recent rescues prior to closure – the full stories are available on the station website — www.newbrightonlifeboat.com in addition to the RNLI statement about the reasons for the closure. 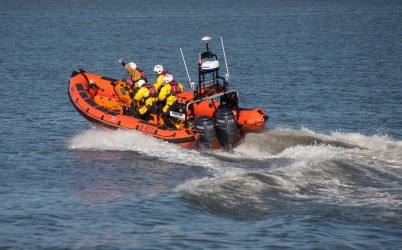 In April our lifeboat was called to assist a person with a suspected heart attack while on a small vessel in the River. 7th June saw the rescue by hovercraft of two people and dog who were on a sandbank and cut off by the tide. 9th June the hovercraft was involved in a very challenging and successful search for two ﬁshermen lost in dense fog off the Wirral coast with an incoming tide. 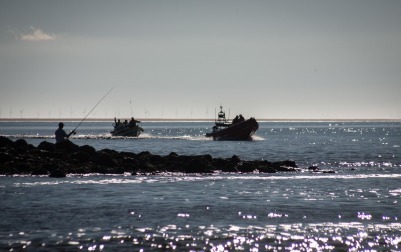 21st June an experienced swimmer was caught in a rip current and ended up trapped in the New Brighton lighthouse breakwater by the incoming tide. She was rescued by two lifeboatmen who approached along the breakwater. On the 3rd of July our lifeboat was involved in a search of the Rock Channel off from the Wirral coast following a MayDay distress call. 11th July saw the hovercraft and lifeboat called to assist when the Mersey Ferry Royal Iris had gone aground at the start of the Manchester Ship Canal. At the same time an aircraft approaching Speke airport reported difﬁculties but fortunately landed safely. On the 19th July the station had what appeared to be a busy and successful Open Day with lots of stalls with all sorts of goodies.shanty songs by The Liverpool Shanty Kings and attendance by The Mayor & Mayoress of Wirral plus our Atlantic 85 lifeboat proudly on display. 21st July— RNLI closed down the station and dismissed many of the crew involved in the recent rescues. This is my last report for Walrus as I have decided to retire as volunteer press officer for the lifeboat station. 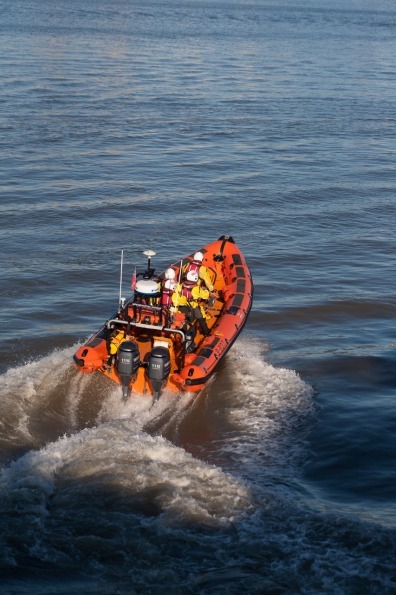 This article was written in mid August — my hope is that by the time you read this we will have once again a fully operational lifeboat station with hovercraft and lifeboat manned by experienced crew safeguarding the people of the Wirral and Merseyside. I hope you have enjoyed the many write ups of the stations activities over recent years. 24 at the time signed a grievance stating that we were unhappy with how things were being run and yet it is the majority of those 17 who now ﬁnd themselves not on call 24/7, doing what we do best…….saving lives at sea. Days before the station was closed we carried out a rescue, the RNLI state in their press releases that we were “operationally ineffective“, wonder if those in the ﬁshing boat that was rescued felt that way? The lifeboat is not on full service, it will take over 300 years for that to happen. How long are the local public prepared to wait? We would guess not as long as 300 years? The RNLI is a massive organisation, we are just a few. We would ask you to ask yourselves why you‘ve only heard from the dismissed crew and RNLI Headquarters, nothing from the management who caused this and still remain in post. The truth will come out. We have the evidence to support the truth. To Bob Warwick the station press officer our thanks for everything that you’ve done as press ofﬁcer. You’ve built the proﬁle of the station at New Brighton and been a great friend to the crew. We only hope all your hard work does not go to waste with the mess that has been engineered at the station. We want the lifeboat back on service as effectively as it was 12 months ago, with experienced, well trained, knowledgeable and passionate crew, who at a moments notice will be there when needed. Our families use our coastline and we want them and you to be safe. from the 1960s and World Cinema. Over the summer some of our youth attended the International gathering of Young People with the Holy Father, Pope Francis in Krakow for the 31st International World Youth Day; whilst others worked helping the sick for a week during the annual diocesan pilgrimage to Lourdes. Now after a refreshing summer break we are now looking forward to committing ourselves afresh to sharing the good news of Jesus Christ with everyone! more about the Christian faith within the Catholic church then watch out for announcements in our weekly newsletter. Don’t forget you can always catch up on all the latest information by checking out our social media: @HAMParish or ﬁnd us on Facebook. Are you an organisation. business looking for premises? Very competitive prices: £10 hour, we will beat any price! every Thursday from 7pm till 9pm and a very warm welcome awaits all those that come along. seek the assistance of the ICT Facilitator should they have any problems or need further advice. Residents can also scan docu ments, use the photocopier or fax. problems with anti social behaviour and other associated problems. and tablets, held every Monday from 7pm till 10pm. provided. Phone Iris for more details on: 638 8472. AA-Alcoholics Anonymous– Every Tuesday morning 11am. bring along your donations for the Book Sale. All proceeds will go to the library. SATURDAY 3rd SEPTEMBER 10-12pm. LOCAL HISTORY QUIZ Individuals, not teams. along and help to raise money for Macmillan Cancer Support. MONDAY 28th NOVEMBER 2-4pm ’CHRISTMAS CELEBRATIONS‘. Mince pies, Coffee, with ’Singme Merseyside’ Choir. 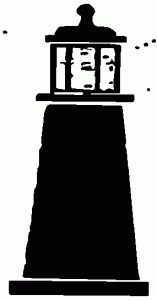 WIRRAL LIBRARIES POETRY WEEK – 1st-8th OCTOBER. Also, to include the launch of The Chris Salmon Poetry Competition. along to read your own Poetry out! All ages welcome. TUESDAY 4TH OCTOBER 6-7.30pm OPEN MIC EVENT at West Kirby Library. Come along to read your own Poetry out! All ages welcome. THURSDAY 6TH OCTOBER 6-7.30pm NATIONAL POETRY DAY at Wallasey Central Library. Readings from, David .I Costello Angela Topping and Sheila Templeton. was there long ago? What stories are hidden in its history? 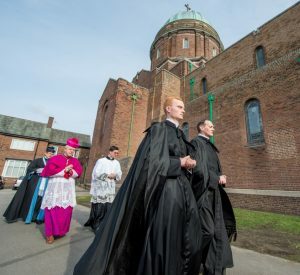 It is sixteen years since proposals were submitted to declare the Magazines Area of Wallasey a Conservation Area which by deﬁnition recognises the historical and architectural elements which make our Area special. In Wirral there are twenty six Conservation Areas including several historic villages and other areas which make Wirral unique. 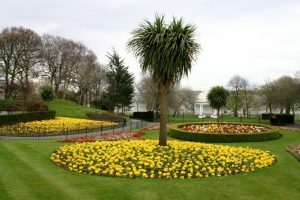 It is not difficult to see why the Magazines are included with its wide promenade, the beautiful Vale Park, and its links to Merseyside’s maritime past through the gunpowder magazines and fortress. preserve the nature of the Conservation Areas for future generations. Conservation Areas on the Wirral are regulated by Wirral Borough Council and a specially appointed Conservation Ofﬁcer can give advice to residents or can be contacted by visiting www.wirral.gov.uk. If anyone living in the Area is keen to join an informal working group to represent local views on the Magazines and its future promotion and development please contact Paul Wilson on 0151 630 2225 or Vicki Hall on 0151 639 7292. The Liverpool Medical Institution (114 Mount Pleasant, Liverpool, L3 5SR) is one of the oldest medical societies in the world, tracing its origins to the founding of the Liverpool Medical Library in 1779. The present Grade II* listed building dates from 1837. 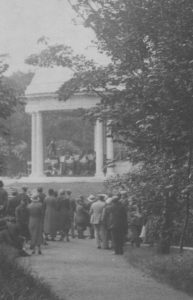 As part of Heritage Open Days there will be tours of the old building of the LMI, including the Lecture Theatre, Council Room and Library. An outstanding collection of medical books, journals and artefacts in a unique library setting. Steep yourself in 200 years of medical history as you explore the wonderful building, discover Liverpool medical pioneers and visit the magniﬁcent Victorian Lecture Theatre. 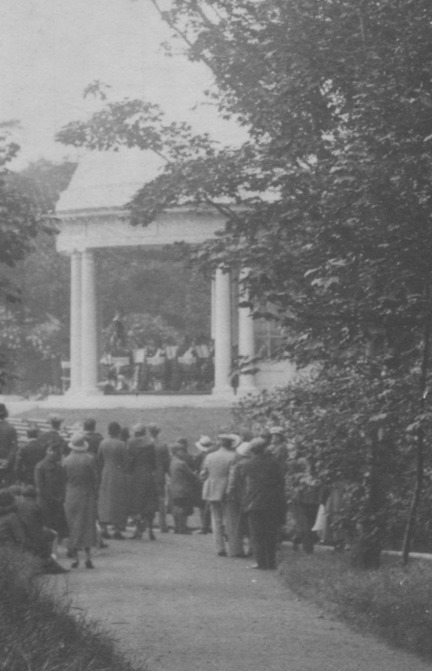 The tour lasts approximately one hour, and is not suitable for children under 16. Wheelchair access is at the rear of the building via the car park entrance. Directions: the LMI is opposite Liverpool Metropolitan Cathedral and next door to the Everyman Theatre. In the last edition of Walrus we looked together at a selection of our local problems and since then some of you have told me about other concerns which you have. There will always be space for them if you write to our editor, Rusty Keane. We also have a great opportunity in this magazine to express real appreciation for the many ways in which you and I are fortunate to live here. I can never understand why so many people seem addicted to life in the overcrowded South of England, where the folk have none of the opportunities which we have to enjoy miles of open coastline or acres of open sky, as they drink their recycled water and breathe their recycled air. If that’s the way they like it, good luck to them, but surely it leaves us counting our blessings in Wirral. There are lots of those blessings. 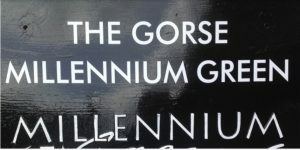 One of lies in the existence of our Wirral Older People’s Parliament (WOPP for short), which is well known throughout the nation. It meets once a quarter in the Town Hall and is designed to enhance the lives for those who are in their more mature years, though younger people are also welcome and nobody is ever turned away. You do not have to be elected. Just turn up—whatever your age. It gives a voice to those who might otherwise be voiceless. A stream of letters go out to cabinet ministers and other national ﬁgures making sure that those who govern us really do know our concerns. You would be surprised how often there is a considered reply. We also send representatives to meet with those who exercise inﬂuence at a local level – the Mayor, the Chief Executive of the Council, the Director of Public Health and others in the Town Hall and elsewhere. There is no reason why you should not be personally involved. You will discover that as long as we work together we can have an enhanced capacity to achieve a wide range of aims and objectives , as for instance when we campaigned against the introduction of parking charges in New Brighton. Public meetings are arranged on matters like Housing and Nursing and Crime. The aim is to enhance understanding of real problems and press for action wherever it is needed. Why not find out more? Just phone the WOPP ofﬁce at 632 5170 and have a chat with Jules or Brian or Terry. You will ﬁnd them very friendly and approachable and they will be delighted to give you the dates and times when the Parliament will next meet and about any other events and meetings which are being arranged. You may be surprised how much inﬂuence you personally could come to have. Don‘t miss out on the opportunity. I am pleased to say that we have not had many reports of anti-social behaviour in the New Brighton area this summer so far. This is because of residents, businesses and partner agencies working together. As a neighbourhood we would like to thank you all for your continued support. We have had a few reports of thefts from vehicles. Remember to make sure your vehicle is secure and all valuables are removed. There have been recent reports of up to two males posing as window cleaners asking residents for money under false pretences in the Wallasey areas Please remain vigilant and look out for vulnerable neighbours. Do not hand over money to anybody unless you are sure they are legitimate and have adequate paperwork to prove this. As a neighbourhood we are actively seeking information on these individuals and will follow up any enquiries. High visibility presence is continuing in the area. activities in the future months. scheme has been installed in New Brighton thanks to the combined efforts of New Brighton PCS&TO’s, North West Ambulance Service, RNLI New Brighton & Promenade Estates. Rob Hussey, NWAS Community Resuscitation Manager for Cheshire and Merseyside said: “The speed of access to a deﬁbrillator is vital when someone is suffering a cardiac arrest and getting the right care immediately can dictate whether someone lives or dies. 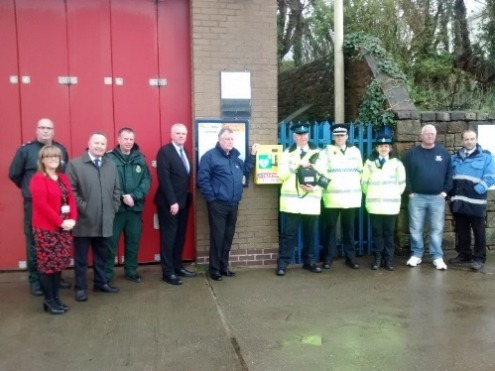 “That is why we are delighted to support this important community initiative by providing and maintaining the AED’s, which have been placed outside the RNLI Lifeboat station, opposite the Travelodge at Marine Point, the New Brighton Community Centre and at the Derby Pool restaurant in Wallasey. NWAS will also provide training in how to use a deﬁbrillator for local businesses and those within the New Brighton community free of charge in August. However, these machines are truly little life-savers and absolutely anyone can use them as they talk you through the process and no clinical training is required.” Another public accessible deﬁbrillator has also been installed at the iconic Shrine Church of St‘s Peter, Paul and St Philemona in New Brighton as part of the British Heart Foundation ‘Nation of Lifesavers’ campaign If you not have already done so, please sign up to MerseyNow to receive crime notiﬁcations and community news in your area. This is quick and easy to do at www.merseynow.org. OCC is the world’s largest children‘s Christmas project and is a Christian organisation. Each shoebox is an unconditional gift, given to a child with nothing asked for, or expected in return; no pledges, no obligation to go to church or attend classes; ’no strings attached’. OCC UK have never put Christian literature into shoeboxes before they are shipped. Where appropriate, the local church or Christian partner distributing the shoeboxes may issue a free copy of a Christian booklet, which contains Bible stories, including an explanation of the true meaning of Christmas. No-one is obliged to take this booklet. It is given to a child with their shoebox, not inside it; the only person opening shoeboxes after UK warehouse checks are completed is the child (a very special feeling for those of us who check boxes!). Many of the churches on Wirral are already actively involved in OCC. If you attend a church that does not participate, perhaps you could encourage them to think about getting involved this year. It is a fantastic way of reaching out to people in your own community and to those in need overseas. Do you have a child or children at school? If so, please ask if the school will be “doing boxes” this year when the children go back to school. shoeboxes bring joy to both the giver and receiver whether you are 3 or 103 and you do not need to take them to a school —there will be drop off points throughout the Wirral. Any church that is participating will be happy to take your box along with their own. Paper and pens/pencils—always a big hit and may enable a child to go to school as in some countries they must provide their own stationary. And of course a small cuddly toy (even for the older boys). Lots of small gifts are more fun than one or two multipacks! Home made items are brilliant — but must not be stuffed (customs requirements!). A card (home-made is lovely) and/or photo — the children really want to know who cares so much about them. Some packets of sweets, no chocolate please (all dated end of March 2017 or later). Last, but not least a £3 donation (or you can pay online) for transportation —this is really essential! You can ﬁnd out more about the organisation by visiting the OCC website (http://www.samaritans-purse.org.uk/what-we-do/operation—christmas-chiId/). You can also visit the OCC Facebook page – where you will ﬁnd ideas and encouragement. Have you noticed those young men in black cassocks, English, American and French, roaming the streets of New Brighton? You might have seen one or two of them on BBC2 on 27th July with The Hairy Biker, Dave Myers, when he visited New Brighton and the Dome to help with the restoration works. They belong to The Dome of Home – that oasis of peace on the hill. But why are they here? These young men have seen the world in all its glory and are discerning whether they should escape the madness and materialism of this world as mediators for a better life for us all. In fact, we have three young men who are discerning their vocation and going to the most beautiful seminary of The Institute of Christ the King, near Florence this September. They are attracted by beauty in art and music to a traditional life and values. The rites are reminiscent of the traditional ceremonies that are part of our English Heritage. How appropriate that the Institute orientates these ceremonies towards the worship of God, and we can all be part of this here in New Brighton! At The Dome, we have completed our second restoration project, with about a third of the building restored, supported by Heritage Lottery Fund, National Churches Trust, Latin Mass Society, Historic Cheshire Churches Preservation Trust and the Duchy of Lancaster Benevolent Fund. Here’s hoping for a third project so watch this space….! Recently, the British Heart Foundation awarded us a Public Access Deﬁbrillator and CPR Training kit and we held our ﬁrst, very successful CPR Awareness Afternoon for the local community, with the help of Nick Blair from North West Ambulance Service. More awareness sessions will follow, possibly an evening so that working people can attend. Coming to Mass in Latin for the first time? Ask someone and we are more than happy to help you. We are all learning but remember what it is like! Weekdays: Mass & Adoration everyday: see details at back of the church. Church is open everyday 83m until 8pm! Just pop in for peace and sanctuary. Youth group: Meet last Friday of the month at 6.30pm. What’s on at the Dome? 2.30pm Guided Tour with Crosby Newman Society but all welcome. Full payment must be made BEFORE publication. Cheques to be made payable to New Brighton Partnership. Rusty Keane, 92 Vaughan Road, New Brighton, CH45 1LP. 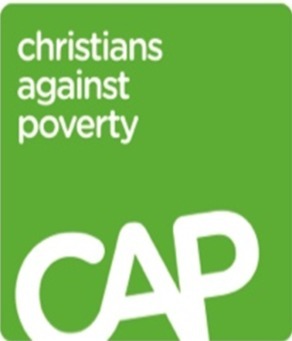 We have trialled a new CAP service at New Brighton Baptist Church. We are a friendly group where we gain practical skills and discover new ways to live for a brighter future. Community: we learn from each other. Everyone ﬁnds dealing with the pressures of life can be stressful and lonely at times. This course is designed to be fun and relaxed, where you can meet people in similar situations, who understand and encourage each other. Course: an eight session course to teach practical money saving techniques, such as cooking on a budget, living healthily on less, making your money go further. We share top tips for dealing with life’s pressures and help you take control of your future. There’s a mixture of practical activities and informal discussions. Coaching: benefit from one-to—one support from a trained CAP Life Skills Coach who will help you think about spending choices and work towards a simple budget. This helps gain better control of money and lighten the pressures money can bring. Members said this of the last course; “Caring, understanding and considerate”, “Good friends and support in time of down“, “Encouraging, non-judgmental”. “Best thing was making new friends and making wiser choices over spending”. A lady on the ﬁrst course, started in October last year, has gained conﬁdence, sought free debt help, gained improved physical and mental health, moved house and found work, after being almost housebound for ﬁve years with anxiety and fibromyalgia. New course starts: 10:303m Thursday 29th September at New Brighton Baptist Church, Seabank Road, CH45 1HG, next door to Magic Spices. The course and lunch that follows around noon are completely free. It is open to anyone regardless of their religious beliefs, race, nationality, age, gender, marital status, sexual orientation or disability. For further information please call Shirley on 07816563688. Pre booking required Please phone 638 0069 before the actual day and leave your name plus contact number. We had a fabulous ‘We Love to Read’ week at Mount Primary with special events taking place every day. The highlights of the week for our children were the author visits from: Phillip Caveney (http://www.philip-caveney.co.uk) over two days in years 3 to 6. Phillip enthralled the children with his adventure stories, exciting plots and mysterious characters. BBTaylor (http://www.bbtaylor—books.co.uk) who visited years 1 and 2. Our children loved her animal stories but were even more excited when BB arrived with animals from her rescue zoo. These included a racoon, owl and fox. Sally-Anne Tapia-Bowes (http://tapia-bowes.com) and illustrator Holly Bushnell visiting F2 and Mrs Higgin’s Year 1 children. The children loved Sally Anne’s magical stories and fabulous illustrations. Their favourite book was deﬁnitely; ‘The Star that Lost it’s Sparkle’. All of the authors fed back to Mr Cassidy and Miss Byrne how much they enjoyed working at Mount Primary with such enthusiastic children and staff. If you want to ﬁnd out more about our authors and their books please follow the website links next to the names. The authors books were very popular with all the children during our Celebration Afternoon book sale. A huge thank you to Tony Higginson at Write-Blend bookshop in Waterloo for his support with the author visits and the book sale. This season the café has been so busy with new and returning customers. Bookings are increasing for celebration parties in the Tea Room from children’s afternoon tea, baby showers. birthday meals, retirement dos, anniversaries and funeral wakes. Please call the café on 0151 638 2666 and ask for the Team Leader to discuss options and prices as all functions are tailored to meet the customer requirements. Our new cake supplier, The Popperie, recently celebrated receiving Great Taste award for their Lemon Drizzle Cake. We place regular orders for this favourite, so there’s usually one in to try a slice. They produce a wide variety of bakes including a selection that are gluten free. Bookings for Afternoon Tea are encouraged to ensure we can cater for each customer’s preference, rather than one tiered plate suits all. £8.50 each ortwo for £15.00. Our Slimmer Friendly Menu is a winner and gaining popularity, covering breakfast, soups, snacks, main meals and Sunday Roast. The Lunch Club, run on Monday and Friday has an average of twenty members, but there is room for a few more. Please call the café to register. 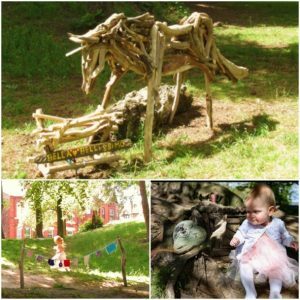 And maybe, just maybe, very soon you will be able to meet the Gruffalo’s wife, hug and eat wafﬂes with ‘donkey’ and take a magical ride on his back to a fantasy world.